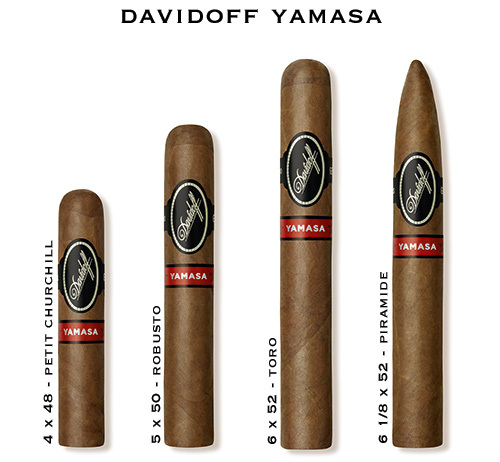 Davidoff Yamasa Cigars - Buy Premium Cigars Online From 2 Guys Cigars . Introducing Davidoff Yamasa, a cigar 20 years in the making. A region untapped, with ideal climate, soil rich in minerals but lacking pH count. Henke and his team would further enrich the soil, raising the pH levels suitable for growing tobacco. This exciting cigar presents the aficionado with an appetizing appearance, in color, shine and oiliness. Davidoff Yamasa immediately introduces notes of spice, leading to notes of nut, coffee, cedar wood, earth and black pepper. The elegant, aged Dominican filler tobaccos, the strong Yamasa binder and sophisticated Yamasa wrapper, complimented by the sweetness of the Condega and spiciness of the Esteli filler tobaccos. All of this combined perfectly to provide an entirely new, stimulating taste experience.